Recently, Bit-Z, a globally digital asset trading platform, has obtained an investment of more than Us $10 million from three international investment institutions. The three investors were Hwazing Capital Limited, Wa Sung Investment Limited, and Plum Angel Investment Co., Ltd.
As shown by the online platform, Bit-Z was founded in 2016 and has been a leading digital asset trading platform in trading volume around the world. It is mainly engaged in offering digital asset trading crypto-to-crypto trading service for users in the world. The so-called crypto-to-crypto trading refers to a trading mode in which a blockchain asset is directly used for exchanging another kind of blockchain asset without involving transit or settlement of legal currency in the course. Presently, Bit-Z has operated for nearly one year, with users to access the website centralized in USA, UK, France, Spain, Brazil and other countries. The Asian users are mainly concentrated in China, Korea, India, Vietnam, and Indonesia. During the daily trading, the biggest pain points for users are security and convenience. The more internalized platform will be confronted with greater challenges in security and stability. To this end, Bit-Z platform adopts bank-level SSL security connections for ensuring the security of user transactions. Meanwhile, it adopts GSLB and distributed server for ensuring the stability of the platform. To be specific, the technical features of Bit-Z include multi-cluster architecture, high-speed memory match-making engine; besides, the designed distributed wallet can ensure timely charging-in and charging-out. The distributed micro-service-based architecture is characterized by high performance. high availability and easy scalability etc. Meanwhile, the visualized monitoring system embedded therein can provide real-time monitoring service, capture abnormal conditions and carry out alarm operation so as to ensure the system to run in an efficient and stable manner. If ensuring of stable and convenient transactions is a basic quality of a trading platform, screening of high-quality projects shall be an essential significance for a trading platform to exist and also an indicator of its core competitiveness. However, under the situation, that currency types are inundate, the charging of currency launch fees has been one of hidden rules and also denounced by some users who hold it to be unfair. 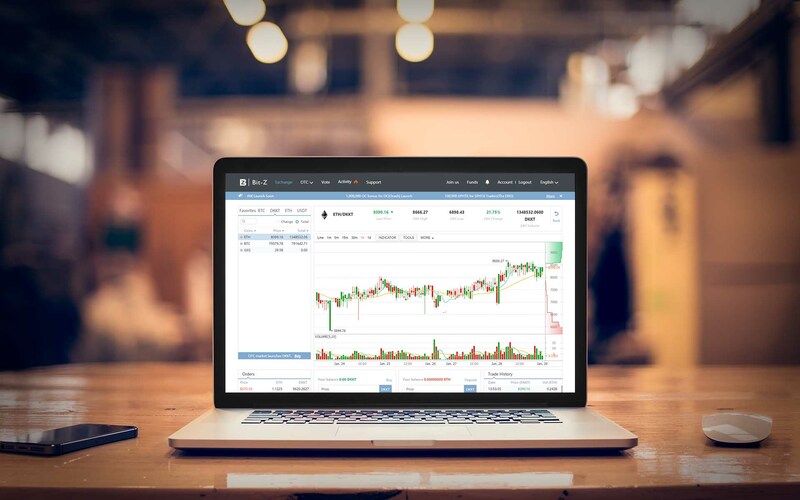 However, to be different from other trading platforms, Bit-Z adopts voting way to achieve free currency launch and have the users to decide the currency types to be launched for online trading without any additional expenses; the platform will carry out comprehensive risk control and management from the team, history, product, strategy, potential and other aspects of the blockchain project, give an effective guidance to the platform’s global users for making investments in a scientific way and safeguard the security of users in transactions. Just like the most essential thinking of blockchain – decentralization, the way for deciding the launch of currency type by voting is also an embodiment of decentralization. The decision-making power has been assigned to the scattered users and the decision is not made by centralized decision-making mechanism anymore. In this way, users will grasp the gaming rules and dominate the market development. Bit-Z platform has opened 4 trading markets: BTC market, DKKT market, ETH market and USDT market. As shown by data of Coinmarketcap, there are more than 60 currency types under online trading through Bit-Z platform. 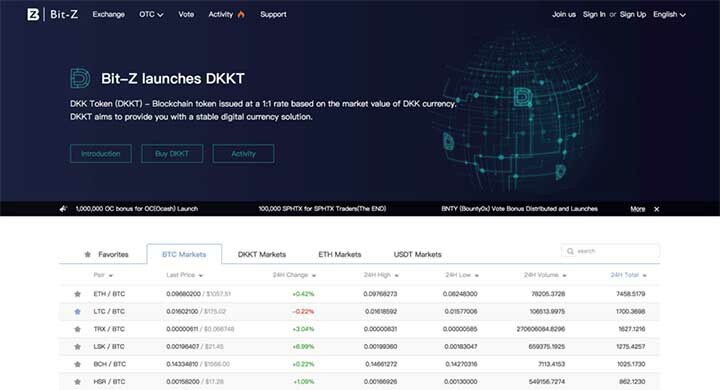 Besides BTC, ETH and other mainstream trading zones, the project launched by the platform also includes DKK Token (DKKT). It is a token based on Danish Krone (DKK), a stable value currency, with an exchange rate of 1 DKKT=1 DKK. DKKT aims at providing a stable digital currency solution and promoting the practical application of blockchain technology in traditional finance, politics, law, social science, science and other fields. The most typical feature is that it is almost equivalent to Renminbi, 1 DKK ≈ 1 RMB, allowing it to be a good value-preserving token in the volatile crypto-currency market. A senior insider told me that the current head trading platforms in the sector have strong technical strength. They have usually built a technical team for carefully reviewing the code of a candidate token. As a matter of fact, building a good trading platform system is helpful to squeezing the moisture out of the sector. Coincidentally, in the earlier days, another head digital asset trading platform also announced its completion of a new round of fund-raising. This indicates that, even during a period when the policy remains unclear, a number of trading platforms including Bit-Z have obtained the investment of top investment institutions in succession. For VCs, they usually bet on the key sectors in the next five years. It also indicates that the blockchain sector will be under a state of relative disorder and chaos within the short term, but it has a promo sing prospect in the long-term run. Various countries in the world have different policies to deal with blockchain assets, however, some countries have been at the forefront. For instance, Japan has released licenses to trading platforms; Bit licenses have also been issued in some states of USA. Along with the implementation of a licensing system in Japan and USA, it has more proved that the blockchain assets enjoy a huge potential for development in the future. As for blockchain technology, the founder of Tripod Advisors David Schlesinger noted that blockchain is just like a beehive, in which all the cells are interconnected. If one of the cells disappears or is damaged, attention will be drawn immediately. The hive will not be completed anymore. As a consensus on blockchain technology has been increasingly reached in the whole society, the ecosystem of the blockchain has become more and more perfect and the demand for issuing and trading of the token has also been more vigorous. For digital currency trading platforms, the significance of their existence lies in that it cannot only promote the sound development of the industry but also share the dividend of the sector and keep a good profitability. For blockchain, one of the major advantages with great hope is pinned its decentralization, with no intermediaries getting involved therein. 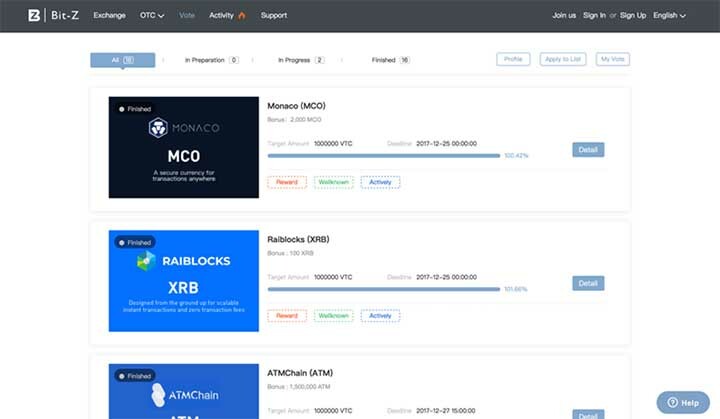 In this case, token plays its function of rewarding and bookkeeping, which enables all the nodes of the chain to be motivated in getting involved in bookkeeping. If the token has been taken off, it needs a third party to play the function of bookkeeping, that will be a mode of centralized organizational structure, which will lose the value of blockchain which is mostly concerned. Just because of this, the token is a cornerstone to keep a huge blockchain system in operation. As a cornerstone, it shall be liquid. In this case, the trading platform shall play its role of pivot, with one side corresponding to fund suppliers and another side corresponding to providers of innovation projects. The trading platforms will deliver the inexhaustible sources to the parties of technical innovation and enable the fund providers to appropriately share the results of technological progress. Only such a resource allocation mechanism can ensure the blockchain technology to develop in a sound and sustainable way. Presently, the sector is still in an early stage, so currencies of bubble and air are inevitable. Gain by only relying on a concept will result in bubbles and trigger some discussions adverse to the sector. However, at a stage that the sector varies in level, the significance of trading platforms will be particularly prominent. If trading platforms persist in screening and selecting high-quality projects, they will have opportunities to make good money drive bad one out and clear off the chaos of the market. The pivotal role of trading platforms also means that trading platform is a business model with typical Matthew Effect. The commercial rules of high user stickiness, high migration cost, and the strong-remaining-strong will prevail here, thus, for digital asset trading platforms including POLONIEX, Bittrex, and Bit-Z etc. For crypto-to-crypto trading, time will be their friend. Many people think that application and implementation are insufficient for blockchain sector presently. Such an argument has actually ignored the existence of trading platforms. In fact, the trading platform itself has been a well-established application. It not only envoys stronger technical team and can bear high concurrency transactions, but also makes more profits. Compared with a lot of business models’ difficulty in implementation and the profitable prospect at an indefinite date in the future, the trading platform is currently occupying a favorable position in the blockchain field. Presently, the market value of blockchain assets is around US$300 billion, more than 70 times of that 3 years ago. Through the development of blockchain application over the past years, the market value of blockchain assets is expected to reach up to a size of 10 trillion in the coming 2-3 years, exceeding the volume of gold today. The demand of people for allocation of digital assets continues to rise, which can be found from the 24-hour turnover of a few head platforms in crypto-to-crypto trading. Blockchain is an interesting sector indeed. The rule of internet giants-taking-all, a popular one in centralized model, ceases to be effective here. For miner sector, digital currency sector or trading platform, few internet giants have got involved in. On the one hand, they know less about it; on the other hand, the giants are not willing to put their arrogant status aside. Today, along with the rise of several trading platforms and mainstream digital currencies, these marginal forces are stepping to the center of historic stage. For more information about Bit-Z please visit bit-z.com.